A weather station in your future? Sure, it’s sunny now. Winter weather isn’t far away, though, and it’s going to get really cold really fast, really soon in a lot of the country. That’s where a weather station comes in handy. Maybe you remember going to the house of an older relative and seeing some gigantic brass contraption that looked like an 18th century sailing vessel. That, combined with a large plastic thermometer (for some reason these often looked like sunflowers) was pretty much the state of the art in personal weather management when most of us were kids. How things have changed! 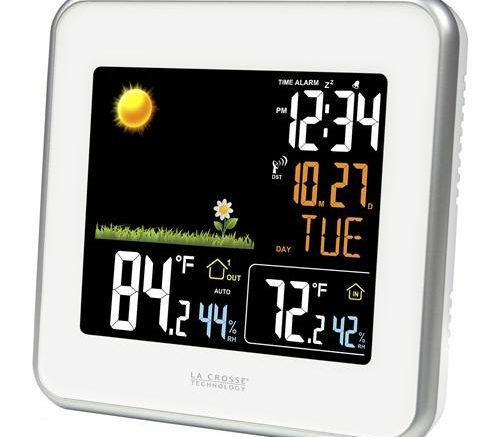 For less than you spend on a week’s worth of coffee, you can get a wireless weather station like the one you see above and learn about weather inside and outside… even be able to predict the weather as well as any meteorologist! If you look at the complete list of weather stations, you’ll find devices that do more than just temperature and humidity. You can get wind speed, rain accumulation and more, and you can even use some of these devices to send information to your phone. “But wait…” I hear you saying, “My phone has a weather app and it’s pretty darn good. You’re right, but that weather information could be from a station several miles away or it could be an average of several pieces of information from distant weather stations. It’s not the weather right at your house and let me tell you why that’s a problem: because when things start to get bad, you need to know what the weather is at the house, not miles away. People in mountainous regions know that weather can change within just a couple of hundred feet and the danger level can spike. Relying on a weather measurement from a few miles away could be disastrous. If you’re out in the great plains, you know that weather can be deadly. Knowing wind speed and direction at home is much more important than knowing what it is a few miles away. Plus, phone apps don’t tell you important facts like wind speed and barometric pressure, which can be early indicators of tornadoes and funnel clouds. When those strike, you have very little time to get to shelter, and a weather station could be the difference between safety and danger. Today’s weather stations are easier than ever to use, and installation is (pardon the pun) a breeze. The simplest ones just require you to put a wireless outdoor sensor in an area where it’s not hit by direct sun, and that’s it. If you’re looking for more data you’ll want to get up on the roof to put up a wind speed monitor, and possibly put in a rain gauge somewhere on the property. The amount of difficulty is up to you, and you can use a weather station that’s as simple or as complex as you feel comfortable with. Weather stations are also great gifts because, assuming you don’t live underground, in solitary confinement, or in a biosphere, everyone needs to know what the weather is like outside. A lot of weather stations are reasonably priced and come in nice retail packaging that highlights the different things they do. Many come with full color screens, too. The large numbers of a weather station will also be a relief to those who struggle to see their phones, and I think we all know someone who’s in that category. Older relatives may have wanted a weather station all their lives but not known how affordable or simple they’ve become. So why not be a star this holiday season and give the gift that keeps on forecasting? As you see, there are a lot of reasons to use a weather station rather than just the app on your phone, and the best selection of weather stations, of course, can be found by shopping at SolidSignal.com.